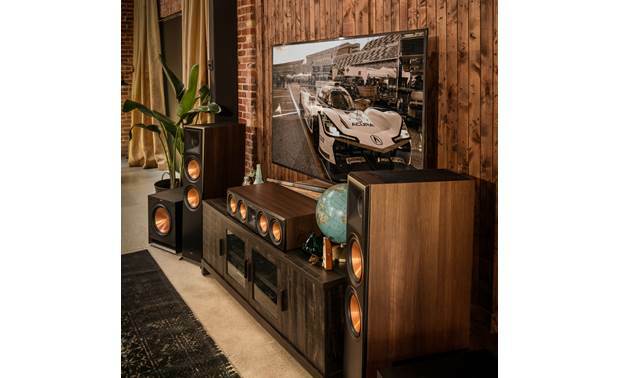 If you want truly immersive sound from your home theater, consider using the Klipsch Reference Premiere RP-8060FA tower as a left- or right-channel speaker in your system. 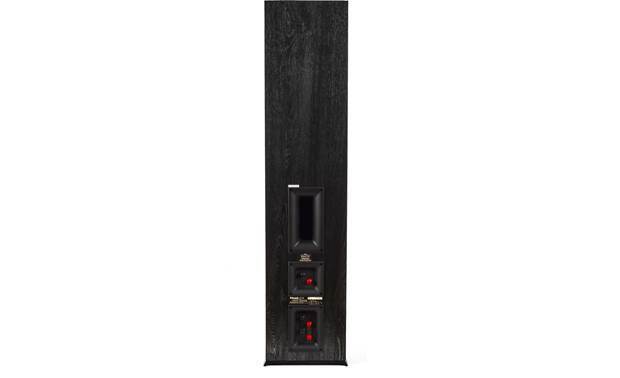 This giant floor-stander is really two speakers in one — a feature-packed Klipsch tower that's terrific for music and movie soundtracks, and also a Dolby Atmos upward-firing speaker that bounces sound effects off of your ceiling. This is the most capable speaker in Klipsch's 2018 Reference Premiere lineup. Its "main section" features two 8" spun-copper woofers for deep, powerful bass and midrange, along with Klipsch's signature 1" horn-loaded tweeter for smooth, detailed highs. It also has an upward-facing 6-1/2" woofer and 1" horn-loaded tweeter, which together provide three-dimensional sound effects in your room. The Klipsch Reference Premiere RP-8060FA has an upward-firing array that bounces sound effects off of your ceiling. Take a look at the back of the RP-8060FA and you'll find that instead of the conventional round port tube found on many speakers, Klipsch uses a Tractrix horn-shaped opening for smoother, more efficient airflow in and out of the cabinet. The resulting decrease in air turbulence makes for cleaner, more powerful bass with reduced port noise and low-frequency distortion. On the back of the RP-8060FA you'll find two sets of speaker input terminals for the main speaker section. These let you bi-amp or bi-wire your speaker to get the best sound out of it. There's also an additional set of input terminals that connect to your receiver's height channel to power the Atmos array. Awesome sound just to big for my living room. I was really distraught having to return them. Currently rethinking my next move which will almost shorely involve a Klispch product. Also crutchfueld support through this process has been nothing short of remarkable. Thanks! Integrated Dolby Atmos Speaker: The Reference Premiere RP-8060FA Dolby Atmos enabled floorstanding speaker includes a built-in elevation channel speaker integrated into the top of the speaker to reflect sound off the ceiling to deliver the overhead Dolby Atmos experience in addition to stereo sound towards the listener. The integrated up-firing speaker consists of a 1" titanium LTS tweeter mated to a 90° x 90° square Tractrix Horn, plus a 6.5" Cerametallic cone woofer. Note: Dolby Atmos delivers captivating, object-based sound that places and moves audio anywhere in the room to bring entertainment alive all around the audience. With Dolby Atmos sound comes alive from all directions, including overhead, to fill a home theater with astonishing clarity, power, detail and depth. Learn more out Dolby Atmos here. 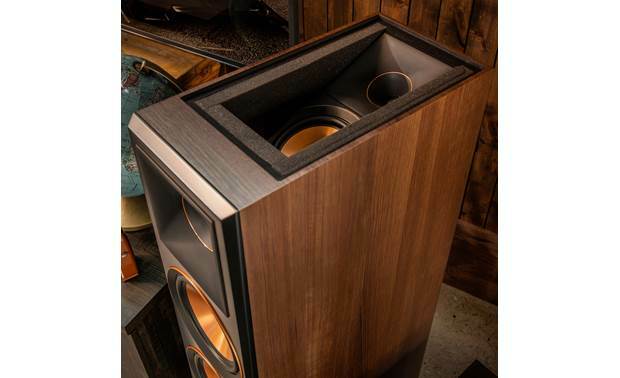 1" Horn-Loaded Tweeter: The Klipsch RP-8060FA floorstanding loudspeaker features a 1" Titanium LTS Vented Tweeter with a Hybrid Tractrix Horn for exceptional high frequency response, detail, and dispersion. Klipsch proprietary Tractrix horn-loaded technology ensures high-frequency energy of the RP-8060FA floorstanding speakers are aimed directly at the listener and reduces unwanted, artificial reverb caused by indirect sound bouncing off walls - meaning you experience the most clear, detailed, lifelike sound possible. 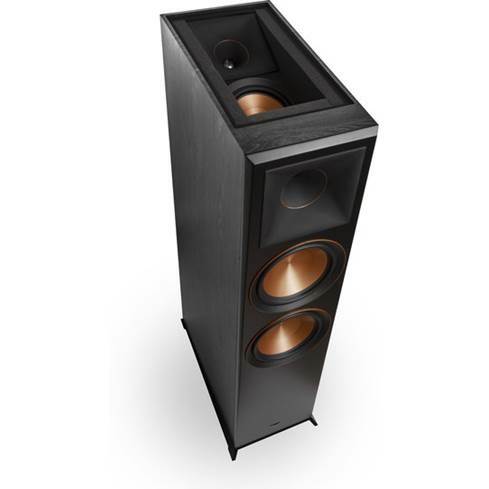 Dual 8" Cerametallic Woofers: The RP-8060FA floorstanding loudspeaker utilizes two 8" Klipsch Proprietary Cerametallic woofers. Cerametallic consists of extremely light, rigid materials that can hold shape while being able to deliver lower frequencies with maximum efficiency. The Klipsch Cerametallic cone is matted to a dual-layer, copper-wound voice coil for exceptional conductivity. The 8" woofers are housed in a non-resonating, stamped-steel basket that's secured to a large magnet motor for exceptional efficiency and low distortion. Power Handling: The RP-8060FA's main front channel, consisting of one 1" Tractrix horn-loaded titanium tweeter and two 8" Cerametallic woofers, can handle up to 150 watts continuous (RMS) and 600 watts max (Peak). The R-8060FA's up-firing Dolby Atmos channel, consisting of one 1" Tractrix horn-loaded titanium tweeter and one 6.5" Cerametallic woofer, can handle up to 75 watts continuous (RMS) and 300 watts max (Peak). Rear Tractrix Port: The rear Tractrix port of the RP-8060FA floorstanding loudspeaker is perfectly matched to the cabinet and woofer, creating ideal airflow with minimal distortion and turbulence even at the lowest frequencies. Klipsch Tractrix ports have custom designed inner flares that help reduce air turbulence entering the port. Less turbulent air helps reduce port noise for cleaner, more powerful bass. 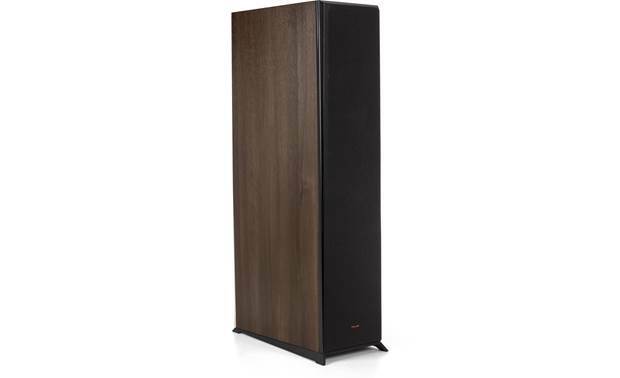 MDF Cabinet: The Klipsch RP-8060FA floorstanding speaker features a MDF cabinet with a scratch-resistant, textured wood grain vinyl that seamlessly integrates into almost any room or decor. The enclosure's reinforced MDF construction reduces cabinet vibration for less audible coloration and improved sonic accuracy. The MDF enclosure also features a satin painted baffle with a scratch resistant design for an elegant look without the grille. 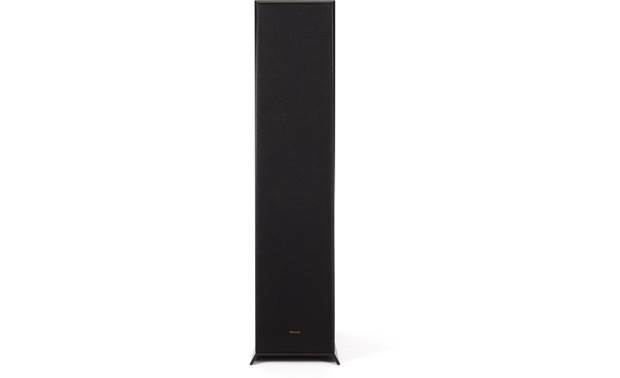 Acoustically Transparent Grille: The Klipsch RP-8060FA floorstanding loudspeaker comes with a removable, black cloth grille that is magnetic and acoustically transparent. This strong magnetic grille provides protection and a sleek aesthetic look to compliment your home's decor. Binding Posts: The Klipsch RP-8060FA is outfitted with two sets of binding posts for the front speaker channel and one set of binding posts for the height (elevation) speaker channel. These sturdy binding posts ensure a secure connection to many types of cable and connectors. The binding post terminals will accept banana plugs (single only), pin-connectors, spade-lugs and bare wire (up to 10AWG). Two plastic caps will need to be removed to use banana plugs. Front Channel: The Klipsch RP-8060FA is fitted with two sets of binding posts for the front speaker channel, allowing to bi-amp or bi-wire the floorstanding loudspeaker. The front speaker channel binding posts will need to be connected to your AV receiver's main front speaker outputs. If you decide to bi-wire or bi-amp, you must remove the jumpers between the terminal posts (failure to do this could result in damage to your amplifier and loudspeakers). Height Channel: The Klipsch RP-8060FA is also fitted with a set of binding posts for the height (elevation) speaker channel. The height (elevation) speaker channel binding posts must be connected to your AV receiver's Dolby Atmos effects speaker outputs. The speaker terminals are placed low on the cabinet for convenience and an unobtrusive connection. Cast Aluminum Stabilizer Feet: The Klipsch floorstanding loudspeaker includes pre-installed, cast-aluminum stabilizer feet with rubber pads for safe placement on hardwood, tile, laminate, and vinyl flooring. The cast aluminum feet are mechanically designed to minimize surface area in contact with the floor, decoupling the speaker for faster, tighter low frequencies and more detail. No carpet spikes are included, and the speaker will not support optional carpet spikes or other type of feet. Note: Do not remove the stabilizer feet. 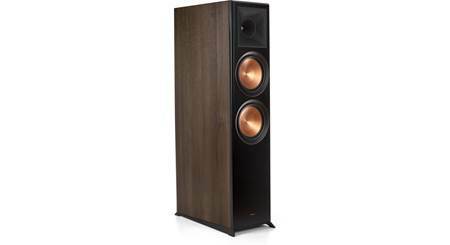 The Klipsch floorstanding loudspeaker should not be used without the stabilizer feet due to stability and sound performance reasons. 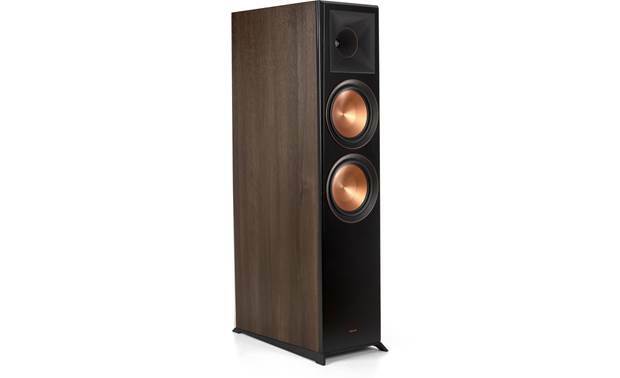 Application & Placement: The Klipsch RP-8060FA floorstanding loudspeaker can be used in a dedicated stereo application or in a home theater application as front and/or rear speakers. Rear Placement: When used as surround speakers in a home theater setup, the speakers should be placed on the walls directly adjacent to the listening position. Another option would be on the wall behind the listening position. 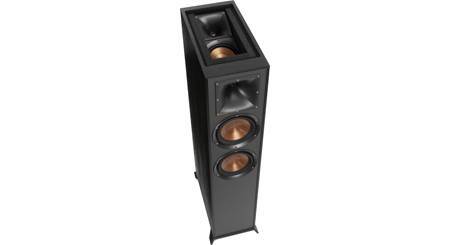 Searches related to the Klipsch Reference Premiere RP-8060FA Dolby Atmos® enabled floor-standing speaker.